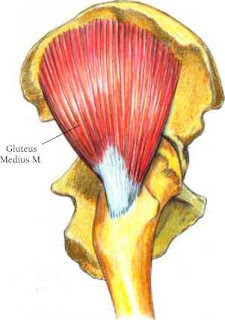 Ahhhh, the gluteus medius. Or as I will call it throughout this blog…the glute med! Unless you are a runner, ballet dancer or a yogi, you probably have never heard of this muscle. But it is a very important muscle in everyday activity. It is one of the three gluteus muscles, along with the gluteus maximus and minimus. The main function of the glute med is abduction of the hip. Abduction is when you move the leg away from the center of the body. The glute med is also responsible for external rotation of the hip when the hip is extended and internal rotation of the hip when it is flexed…more accurately; it prevents external rotation when flexed. The most important job of the glute med, however, is stabilization of the pelvis. Activation of the muscle prevents dropping of the pelvis when standing on one leg. When the glute med is injured or weak, it allows the opposite hip to drop when weight bearing on one leg such as when walking or running. 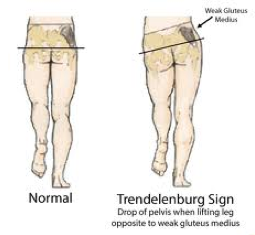 This is called a Trendelenburg sign. While glute med is very important to athletes like runners and dancers, it is equally important to chiropractors. 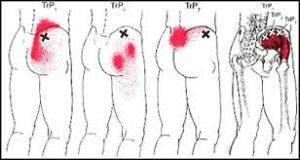 The figure above shows three different trigger points in the muscle and the pain referral pattern for each. All three of these referral patterns present to our office on a regular basis. Patients come in with low back pain and are surprised to learn it’s not their low back at all, but their glutes. The glute med is constantly firing when we are upright so it makes sense that the muscle is overworked. Performing self myofascial release at home with a foam roller or a tennis ball can help work out the trigger points between appointments with your chiropractor. Also, doing therapeutic exercise to strengthen the muscle will help. Exercises such as “clam shells” and “monster walks” are effective exercises to try. Certain activities, or lack thereof, can increase the risk of injury to the glute med. Sudden increase in frequency, intensity and duration of training can lead to glute med injury. Poor strength and flexibility, endurance sports like triathlons, lack of proper warmup before activity, unequal leg lengths and pelvic misalignment can all increase the risk of injury. Correcting these things will help prevent injury to the glute med. If you feel you struggle with any of these risk factors, talk to your chiropractor so you can work together to fix the problems.